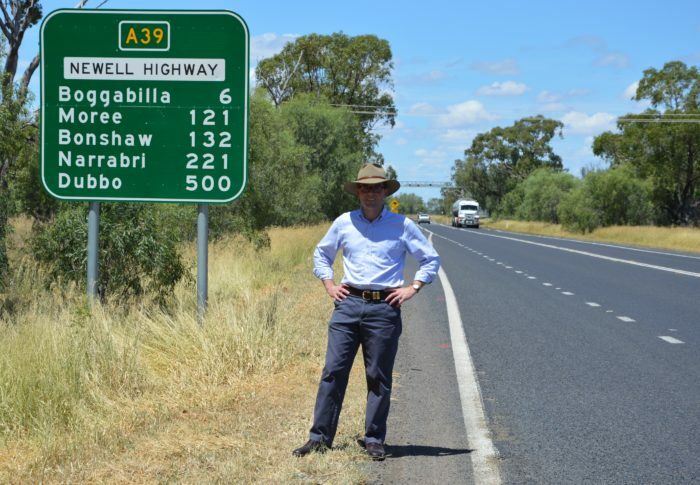 Northern Tablelands MP Adam Marshall on the Newell Highway, which will undergo some massive enhancement works over the coming years. MEMBER for Northern Tablelands Adam Marshall has announced that site investigation work has started this week for a major $4 million upgrade of the Newell Highway between Mungle Back Creek and Boggabilla. Mr Marshall said Roads and Maritime Services (RMS) has engaged Arcadis Australia Pacific to undertake the concept development, detailed design and a Review of Environmental Factors (REF) for the project. “Work will also include surveying, geotechnical investigations and environmental field studies to inform a contract for construction which will be put out to tender early next year,” Mr Marshall said. “The Newell Highway is a vital transport corridor between Melbourne and Brisbane and for our own region, providing freight access between key regional primary industries and export markets. “In May last year a comprehensive report into the corridor strategy identified a large portion of the northern 220 kilometres of the Newell Highway was in need of repair. “Three heavy duty pavement construction projects have since been identified to upgrade the road. Mr Marshall said construction was expected to start in 2017 and would result in a widened road formation, new heavy duty pavement and overtaking lanes in the northern section of the project. “Upgrading this Highway will deliver significant economic benefits to the region by improving freight efficiency, while significantly reducing operating costs for road users as well as future maintenance expenses,” he said.